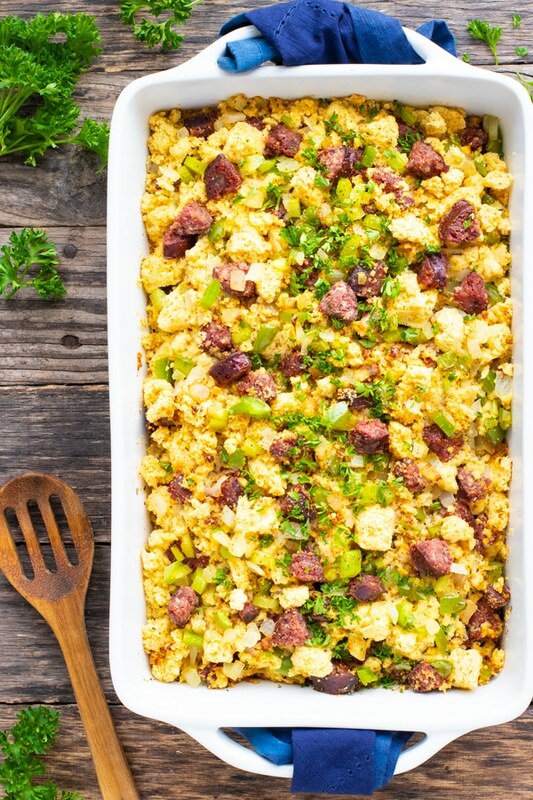 A Southern Cornbread Dressing recipe that is made from gluten-free cornbread, the “trinity” of bell peppers, onions, and celery, andouille sausage, and full of soul food spices. This easy cornbread dressing has been served as a traditional Thanksgiving Day side dish recipe at our holiday table for decades. 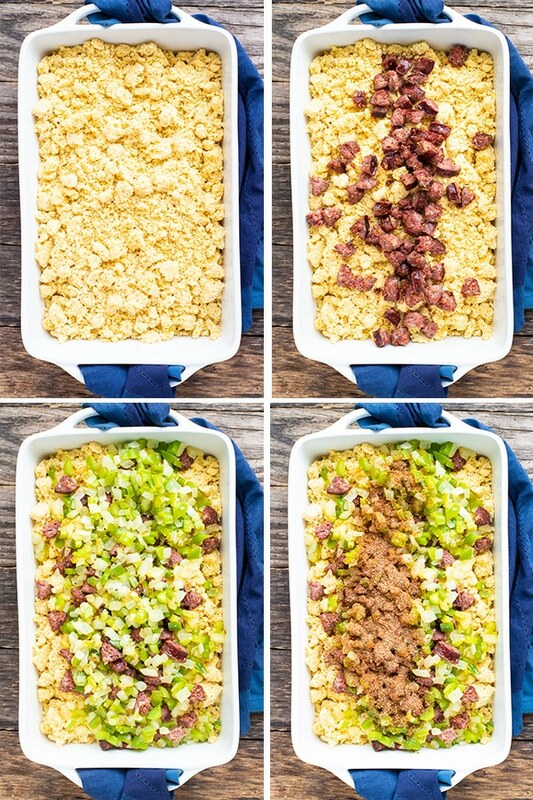 Southern Cornbread Dressing and Thanksgiving Traditions! Looking back, I remember the year my mom and dad were cooking together in the kitchen as they tweaked and improved a traditional homemade cornbread dressing recipe. I grew up on the border of Texas and Louisiana in a small town called Orange, TX. And to top it off, my dad was born and raised in Texas whereas my mom lived in Slidell, Louisiana her entire life. Let’s just say I learned to love the spices from soul food as well as the flavors that are unique to Texas…. and they make quite the epic combo! 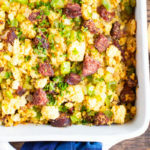 Not knowing much difference, I always thought something similar to this cornbread dressing recipe was what everyone enjoyed as a Thanksgiving Day side dish. 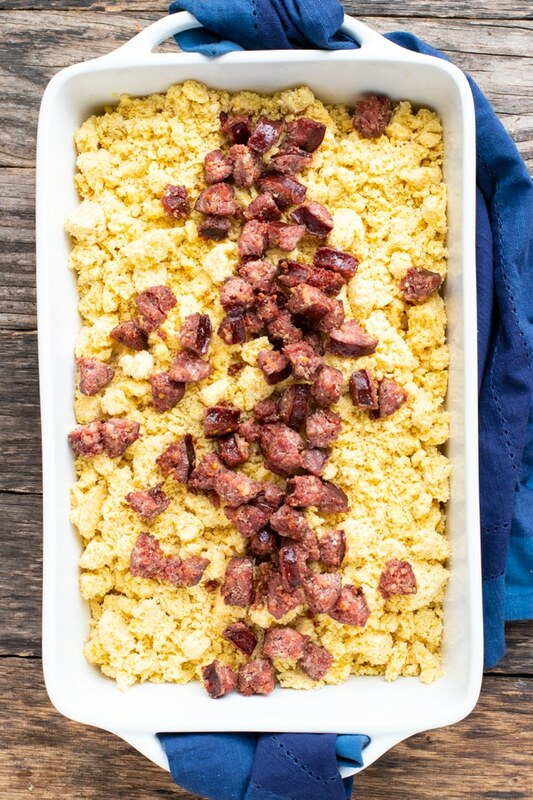 But after years of bringing this dish to multiple Friendsgivings and potluck dinners, I realized this was a homemade cornbread dressing recipe unlike any other out there. My mom and dad knew what they were doing. I got into this whole “food blogging” thing so I could share absolutely EVERYTHING that comes out of my kitchen with you lovely readers… and this prized and cherished family recipe is no different. My hope is that it brings just as much joy to you and your family as it has to the Ham, and now Brazil family, too. Below you will learn how to make cornbread dressing, the best gluten-free cornbread mix, what type of sausage to use, and how to make cornbread dressing in advance for Thanksgiving Day. Prepare and cook your boxed gluten-free cornbread mix. Break apart the cornbread until no large lumps remain. London’s Tip #1: This would be a really fun step to let young kids help with! Cook your link sausage until it is completely cooked through. Saute up the trinity of bell peppers, onions, and celery. If you are not gluten-free, using Tony Chacere’s would be my recommended way. It’s easier and it is the way my mom and dad traditionally made this cornbread dressing recipe. Add all of your ingredients to a large baking dish, pour a bit of chicken broth over it, and bake in the oven. Now that you have made your cornbread dressing recipe and it is ready to go into the oven, how long should you bake it? For this particular homemade cornbread dressing, we bake it for 30-35 minutes uncovered. If you like your dressing a little more crisp, bake it a bit longer. Like it more on the soggy side? Bake it around 30 minutes. Being strictly gluten-free in our house for the past 5 years has led me to try out numerous gluten-free products. Fortunately, when it comes to selecting a gluten-free cornbread mix, you really cannot go wrong as far as taste. However, do note that this recipe calls for a 20-ounce package. If you are unable to find a 20-ounce package, simply make a double batch and adjust accordingly. Our local grocery store, HEB, has a brand that comes in a 20-ounce package and Bob’s Red Mill’s gluten-free cornbread mix comes in a 20-ounce package, as well. What Type of Link Sausage to Use? A big thing to note in the recipe instructions is that it calls for link sausage, preferably andouille-flavored link sausage. You can also use homemade venison sausage. We do this on a pretty regular basis now that the Brazil family makes their own. Try not to substitute for ground sausage, or sausage without a good casing. The bites of sausage really make this recipe unique! One of the best things about this cornbread dressing is that is is really easy to prep completely up to 24 hours in advance. Prepare the gluten-free cornbread mix according to the package directions. You can do this up to 24 hours in advance and store it in the refrigerator. Cook the link sausage until cooked through. Saute your vegetables and mix everything together in the baking dish. Pour half of the chicken broth over the cornbread dressing and store in the refrigerator until ready to bake. On Thanksgiving morning, set the casserole out at least an hour before cooking so it comes to room temperature. Add the additional chicken broth and cook according to the recipe below. 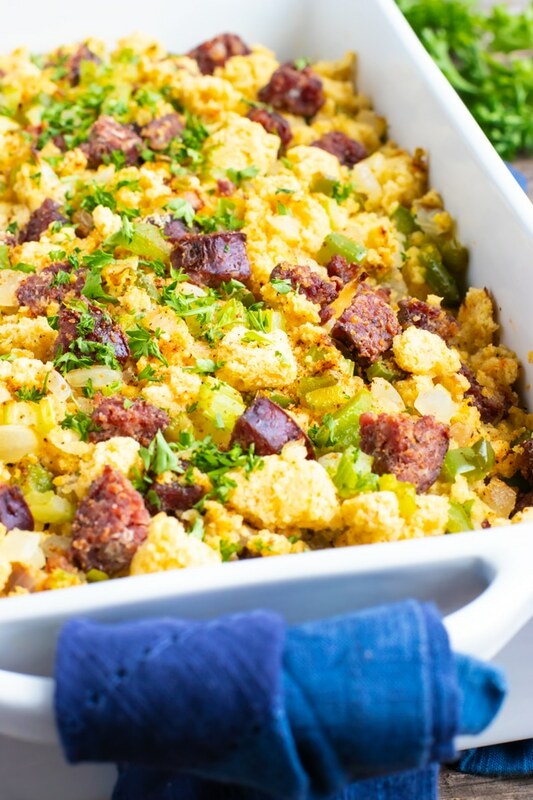 A Southern Cornbread Dressing recipe that is made from gluten-free cornbread, bell peppers, onions, celery, andouille sausage, and full of soul food spices. Cook sausage over medium heat for 10-15 minutes or until sausage is browned. Remove sausage from pan and set aside. With remaining sausage grease, add 2 tablespoons olive oil, bell pepper, onion, celery, ½ teaspoon salt and ¼ teaspoon pepper. Saute vegetables for 8-10 minutes over medium heat, or until onions begin to brown. Add crushed garlic and continue cooking for 2 minutes. 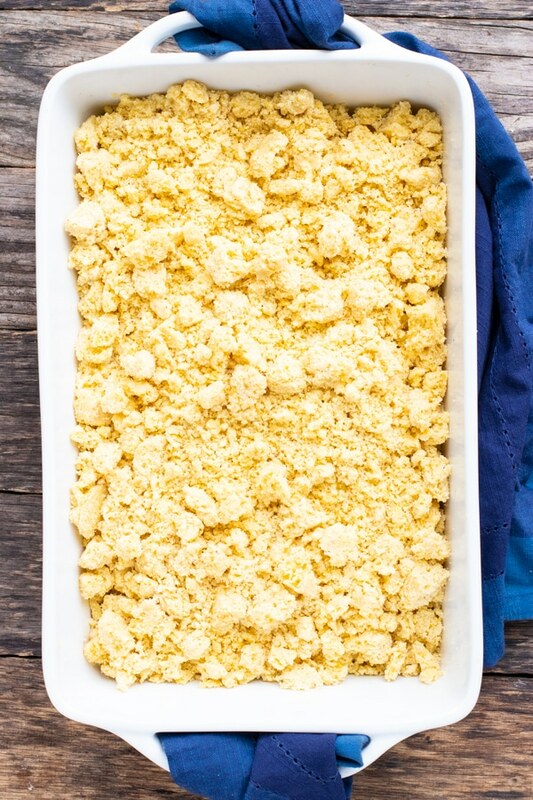 Crumble cornbread until there are no large clumps remaining. 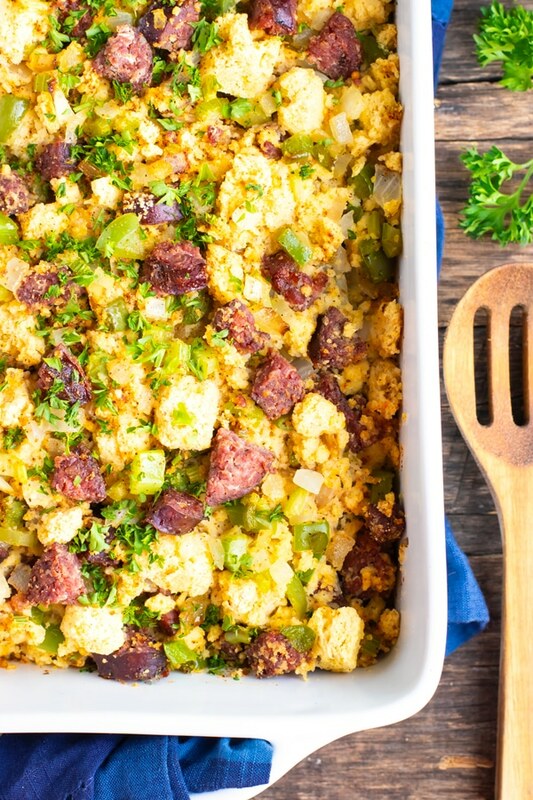 Combine sausage, vegetables, seasoning mix and cornbread in the baking dish. Toss to mix thoroughly. Bake uncovered for 30-35 minutes, or until the top begins to get crispy. Add more chicken broth as needed. Let sit for 10 minutes before serving. Top with finely chopped parsley and enjoy! This was so freakin’ good! My parents are doing the Paleo diet (mostly) and would really appreciate this recipe for Thanksgiving. I’ll be sure to share it! Thanks for another great post; the photos look excellent too by the way! 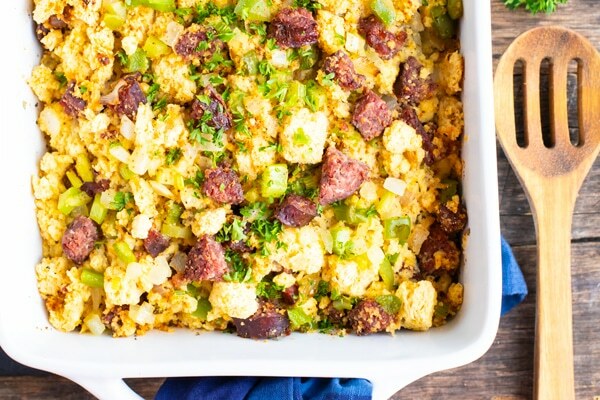 I have never made a cornbread flavoured stuffing before.. what a delicious recipe, this is definitely something I need to try! Hi Thalia! Yes, it is definitely quite a bit different, and so worth a try! Hope you enjoy it!